Brown Thomas Cork recently moved their contemporary menswear collections from the main hub in Patricks Street across the street to their Caroline Street store. 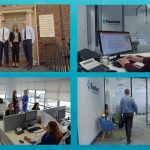 Brown Thomas were primarily looking for a Customer Information Video to help publicise the move so they reached out to Videozoom for a solution. As a result of our initial consultation with the client, we created a production plan and a shooting schedule. Our crew arrived early at the Brown Thomas store before the usual Saturday morning crowds of shoppers arrived. We had a good walk-through the Caroline Street store with the Brown Thomas Marketing Manager. Finally, armed with a production plan and an excellent brief, we set about shooting the footage for the Brown Thomas Customer Information Video. Brown Thomas new Menswear Department in Caroline Street is jam-packed with top brands and high end displays, consequently we were spoiled for choice in terms of getting great footage. We made the most of the short time allocated to the job and therefore started with the interiors. We used a variety of lens and our very cool motorised curved camera slider to capture some great footage for the video. The Customer Information Video is currently loop-playing on a 42″ screen in the Brown Thomas Patrick Street store and this provides a great reason for customers to cross the street to the Caroline Street store to check out the new menswear collections. Reactions from customers and feedback from the client has been very positive and we look forward to working with this great client again soon!